Had it found its way onto the 8-bit market, Whirligig would have been that rare thing for the time, a game planned to be released on all the major gaming markets, the 8-bit, 16-bit and the PC (However, although it was released on the ST and the Amiga, the 8-bit versions (And also PC version according to Richard Hewison) never saw the light of day. The game itself is a 3D space exploration game, although in reality it seems like only a few of the sprites, including the player, were drawn in 3D and the game itself plays pretty much in 2D. In fact it plays like a souped-up version of the classic ‘Asteroids’ and as such seems like it could be easily ported to an 8-bit system. A review of the game in Computer and Video Games Magazine from August 1988 states that the 8-bit versions were to follow in the autumn along with the PC version, ‘no earlier than October’. The PC version made it, so why didn’t the 8-bit versions? Well, Mike Singleton confirms that when Microprose took over Firebird, they decided to drop the C64 versions due to concerns with framerates and also that the markets were dying and did not want to waste too much time on the platforms. Otherwise the games would have infact been completed and released. 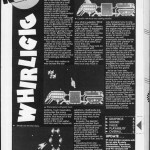 We know from an interview Chris Pink did with the Amstrad CPC Games resource website (http://tacgr.emuunlim.com) that not only did he create the graphics for the PC version of Whirligig but that he also programmed the 8-bit versions. Indeed Chris was involved, and confirms that a C64 conversion did indeed exist. The C64 version was not done by Chris, but by Mike Lyons and most of the Math was done by Chris. The game had a working level system which showed the map (where you could pick a gate to go through to test). The Spectrum and Amstrad versions were fully playable, but also scrapped. The C64 version isn’t available from Chris, but he does have the PC, Amstrad and Spectrum code still… maybe someday people will get to see it. Pink now lives in the states working for Boss Game Studios. We still need to find out why the game was cancelled, but we are guessing it was caught up in the Firebird take over. Question is… what happened to Mike Lyons?… Are you that guy? The game had a working level system for sure. As I said in the original email I put together the math for that and we had the start of level screen working which showed the map (you could then pick a gate to go through to test it). I don’t have any of the C64 stuff. I do have some of the ST, Amstrad and Spectrum code. “As regards Whirligig, 8-bit versions were planned both for C64 and for Spectrum. I’m not sure if you know, but 16-bit versions were actually completed and released on Atari ST, Amiga and PC. At Maelstrom, we had got some 3D graphics working on the 8-bit machines but but the publisher, Microprose wanted to drop these – a combination of concerns about the falloff in the 8-bit market at the time, doubts about whether we could achieve a reasonable frame-rate and lastly, the extra time it might take us to complete these versions. So, we focused on the 16-bit versions instead. The guys credited with those versions had also been involved on the 8-bit side, so I suggest you check the Whirligig credits (must be somewhere on the web) – I might forget to mention someone!!! I did wonder if C64 version was ever even attempted as it seemed to be asking a bit much of the hardware, so colour me surprised to hear it was started. The other thing that made me question ACE’s C64 ver. Imminent Release claim during ST review, was the very next issue had an advert for the game, but only stated ST/Amiga so if all the 8 Bit versions were imminent as Ace claimed, why were’nt they listed as such on the ad?.